Representatives from the International Training and Education Center for Health (I-TECH) attended the fourth international African Society for Laboratory Medicine (ASLM) conference in Abuja, Nigeria, on 10-13 December 2018. The theme this year focused on the role of laboratories in preventing and controlling the next pandemic. I-TECH had seven abstracts accepted at the conference that highlighted the laboratory systems strengthening work done by I-TECH in Cambodia, Côte d’Ivoire, and Zambia. The full abstracts presented by I-TECH can be found in the ASLM 2018 Conference Abstracts Conference Book. I-TECH Laboratory Systems Strengthening Team at ASLM 2018. Pictured (L to R): Sitting – Lucy Perrone, Felicity Golopang, Larissa Koffi; Standing – Sylvestre Kone, Nayah Ndefru, Siew Kim Ong. Siew Kim Ong, I-TECH Cambodia Project Coordinator, was lead author and presenter for the “Improved Laboratory Compliance to Quality Standards in Cambodian Laboratories through On-site Trainings.” This abstract reviewed the effect of training in 12 I-TECH-mentored laboratories in Cambodia on laboratory processes (Page 27). Nayah Ndefru, I-TECH Seattle Laboratory Strengthening Specialist, presented an abstract titled, “Effectiveness of Using a Mixed Approach of On-site Mentoring and Tele-mentoring for Improving Laboratory Quality Management Systems: Lessons From Cambodia.” The presentation looked at the lessons learned in the implementation of a Quality Management System (QMS) in 12 national hospital laboratories throughout Cambodia and the 2018 pilot approach to addressing the QMS gaps identified in an earlier baseline survey (Page 55). Larissa Koffi, I-TECH Côte d’Ivoire RTCQI Specialist, presented two posters: One titled, “Analysis of EQA HIV Serology Data in Côte d’Ivoire Reveals Gaps in Quality Testing.” The second poster was “Analysis of HIV Point of Care Testing Sites in Côte d’Ivoire Reveals Gaps in Tester Competence.” The posters displayed the results of a retrospective study that can inform strategies and interventions for improved quality at HIV testing sites (Page 200). Sylvestre Kone, I-TECH Côte d’Ivoire Laboratory Quality Specialist, presented a poster titled “Improving Quality and Capacity of the Laboratory System in Côte d’Ivoire.” The poster detailed the work the team is doing to train and mentor laboratory staff in hospital laboratories towards achieving international quality standards (Page 242). Felicity Gopolang, I-TECH Laboratory Mentor Consultant, presented a poster titled, “Implementation of a Professional Development Program in Laboratory Leadership and Quality Management in Zambia from 2016-2018.” The poster outlined the impact of the Program on quality improvement (Page 206). Pat Sadate-Ngatchou, I-TECH Seattle Senior Laboratory Advisor, was lead author on the poster titled “Improvement of Quality Practices within HIV Point-of-Care testing (POCT) Sites in Côte d’Ivoire Through Implementation of the Rapid Test Continuous Quality Improvement (RTCQI),” which explored the impact of the implementation of RTCQI in POCT site audits (Page 246). 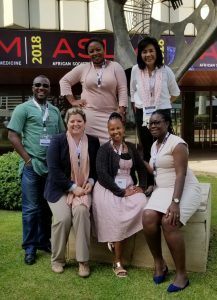 The mission of ASLM is to improve clinical and public health outcomes in Africa by enhancing professional laboratory practice, science and networks. Based on five strategic pillars, ASLM serves the community of laboratory professionals and promotes the value of strong medical laboratories to key stakeholders such as the Ministries of Health, research laboratories, and universities. ASLM is an independent, non-profit organization endorsed by the African Union and headquartered in Addis Ababa, Ethiopia.